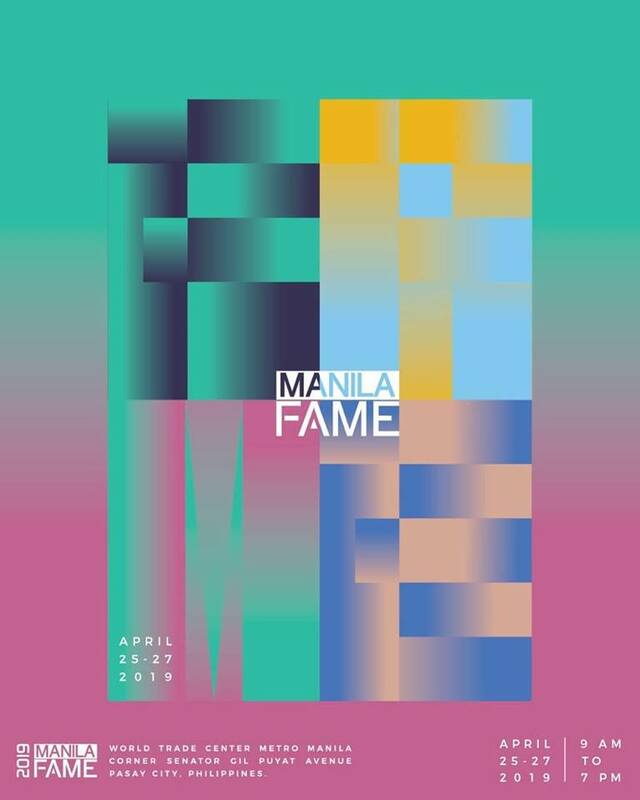 Six months after it highlighted the development of Filipino craftsmanship in the age of e-commerce and digitalization, Manila Fame is back with a new objective up its sleeve: to highlight ingenious works by local artisans who are inspired by designs rooted in our heritage. Read more here on what to expect from this year’s run. The National Music Competitions for Young Artists presents a children’s choir concert on Apr. 25, 6:30 p.m. at Ayala Museum. 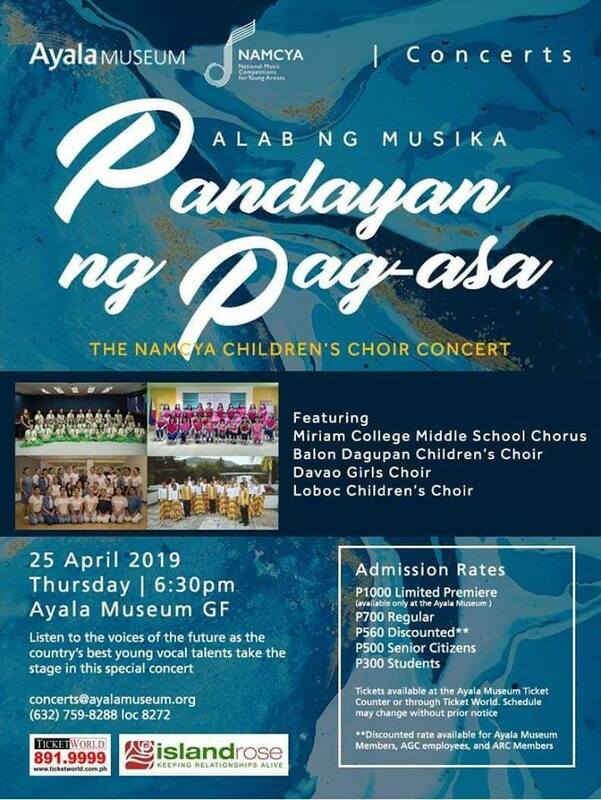 Listen to the voices of Davao Girls Choir, Laboc Children’s Choir, Miriam College Middle School Chorus, and Balon Dagupan Children’s Choir here. For tickets, visit TicketWorld and Ayala Museum or call 759-8288 loc. 8272. Design Week Philippines (DWP) is a biannual festival celebrating Filipino design and creativity. On its 11th edition, DWP will once again drive the country’s creative quotient with a united front of design visionaries, creative warriors, makers, DIY hobbyists, and design enthusiasts. For updates, click here. 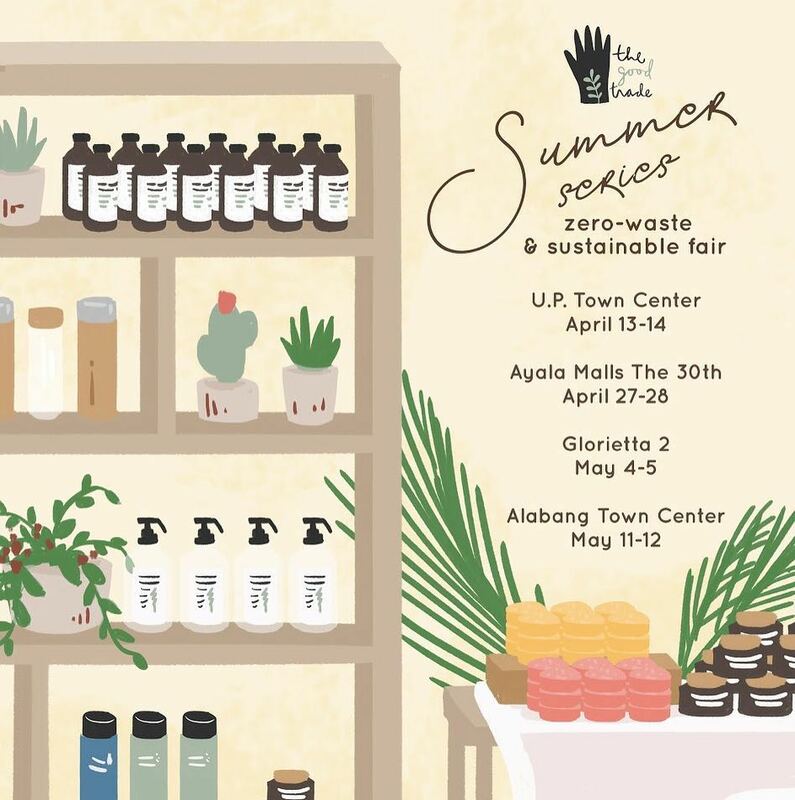 Zero-waste and sustainable fair The Good Trade is going to be in various cities in the metro this summer. So keep an eye on its exclusive offerings and workshops, refillable and alteration stations, recyclables and donations drop-off, and more with the following schedule: Apr. 13 and 14 at UP Town Center; Apr. 27 and 28 at Ayala Malls the 30th; May 4 and 5 at Glorietta 2; and May 11 and 12 at Alabang Town Center. For more information, click here. 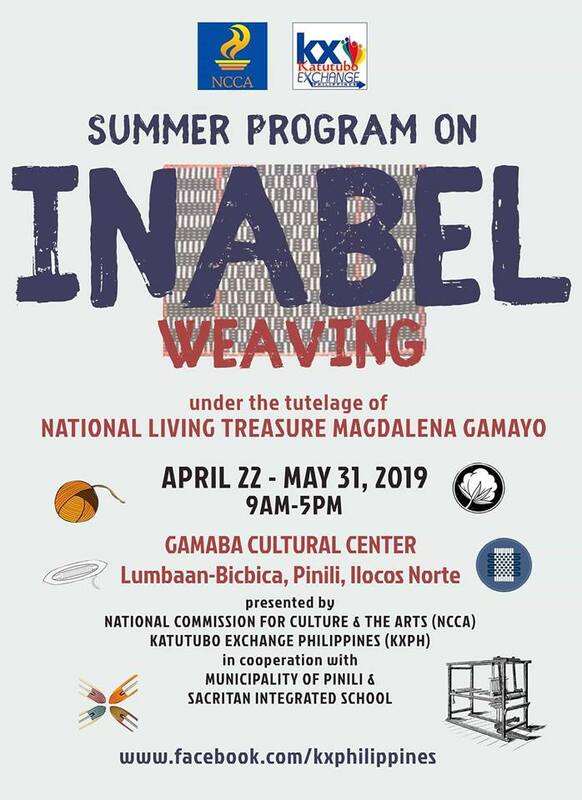 The National Commission for Culture and the Arts and Katutubo Exchange Philippines conducts a Summer Program on Inabel Weaving under the tutelage of National Living Treasure Magdalena Gamayo in Ilocos Norte. To those interested, message Katutubo Exchange Philippines on Facebook. Ateneo de Manila University launches the Ignacio B. Gimenez Outdoor Installation Grant Program, a new program focused on outdoor installation projects in Areté. 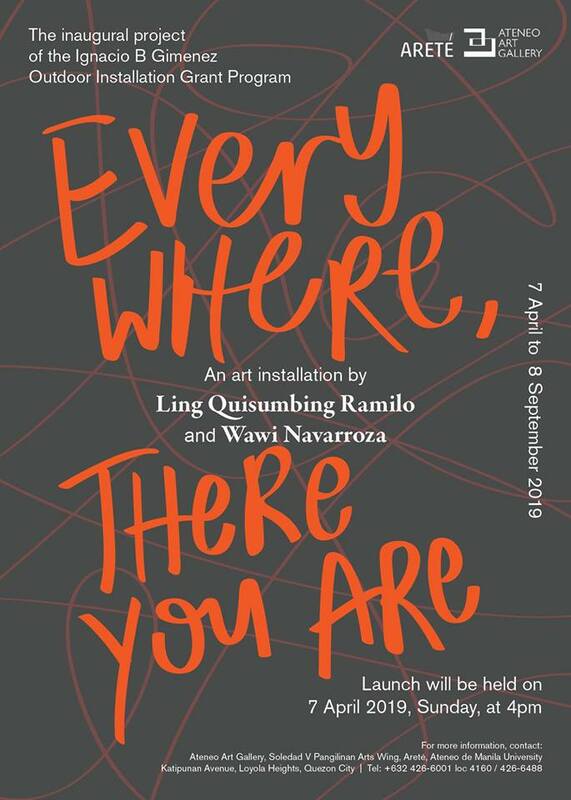 For its inaugural project, Ling Quisumbing Ramilo and Wawi Navarroza re-installs Everywhere, There You Are. It’s an installation created in two editions of the Malasimbo Art and Music Festival in Mindoro. For Areteé, it’s grander in scale, a quality which both artists have always been wanting to explore. For more information, email aag@ateneo.edu or call 426-6488. Discover new food and attend community workshops at “Sundays at the Skypark” at the fifth level of SM Aura Premier, Taguig. It happens every Sunday starting Mar. 31 until May 26 from 8 a.m. to 2 p.m. Admission is free and open to the public. 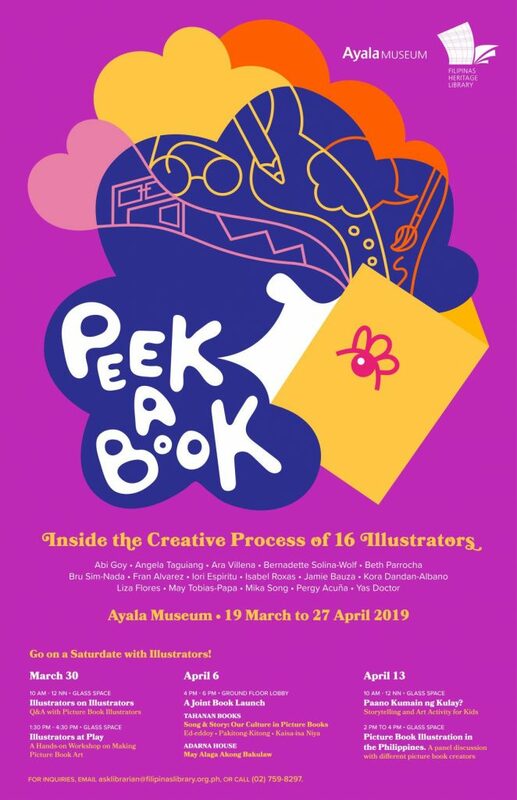 The “Peek A Book” exhibition allows guests to take a peek at the creative process of 16 illustrators including Abi Goy, Yas Doctor, Angela Taguiang, and Bernadette Solina-Wolf. On Mar. 30, Apr. 6, and Apr. 13, there will be activities like a question and answer with some illustrators, book launch, and panel discussions. For more information, call 759-8281. 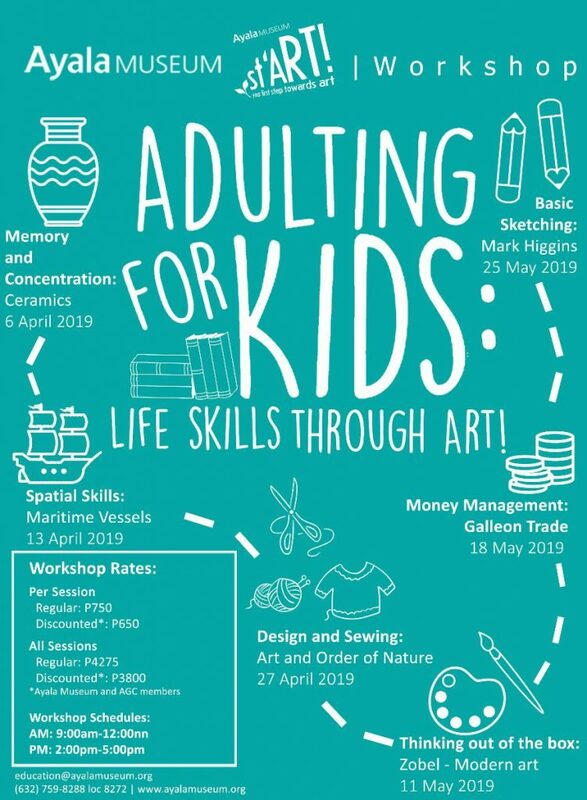 Summer’s here and Ayala Museum has workshops that will teach your kids life skills through art. Each workshop uses art as the lens to focus on a particular skill and characteristic that kids can appreciate and have fun with. They can learn how to read maps, how to make patterns, basics of acrylic painting, and money management among many others. They are open to kids from ages seven to 12 years old. For more information, click here. 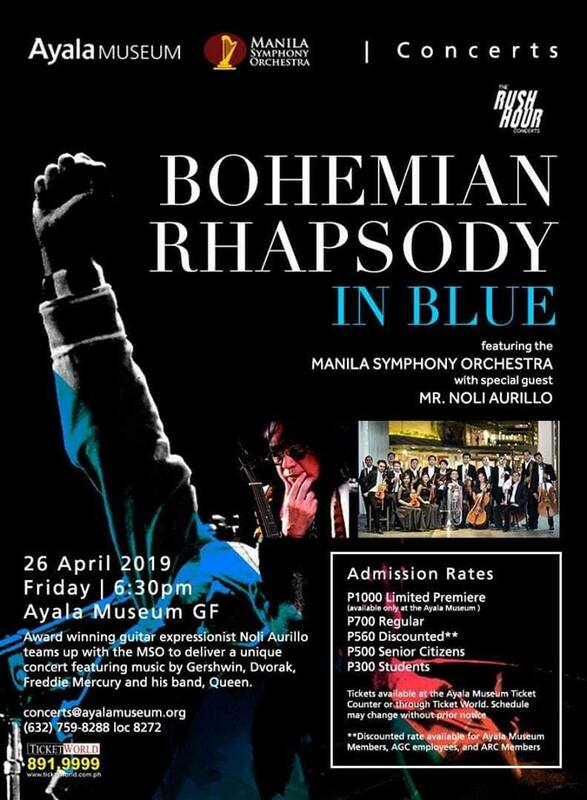 Aliw awardee and acoustic guitar expressionist Noli Aurillo teams up with the Manila Symphony Orchestra to deliver a unique program featuring music by Gershwin, Dvorak, Bizet, Freddie Mercury and his band Queen. For tickets, go to TicketWorld website or Ayala Museum. For more information, send an email at info@manilasymphony.com or 523-5712. 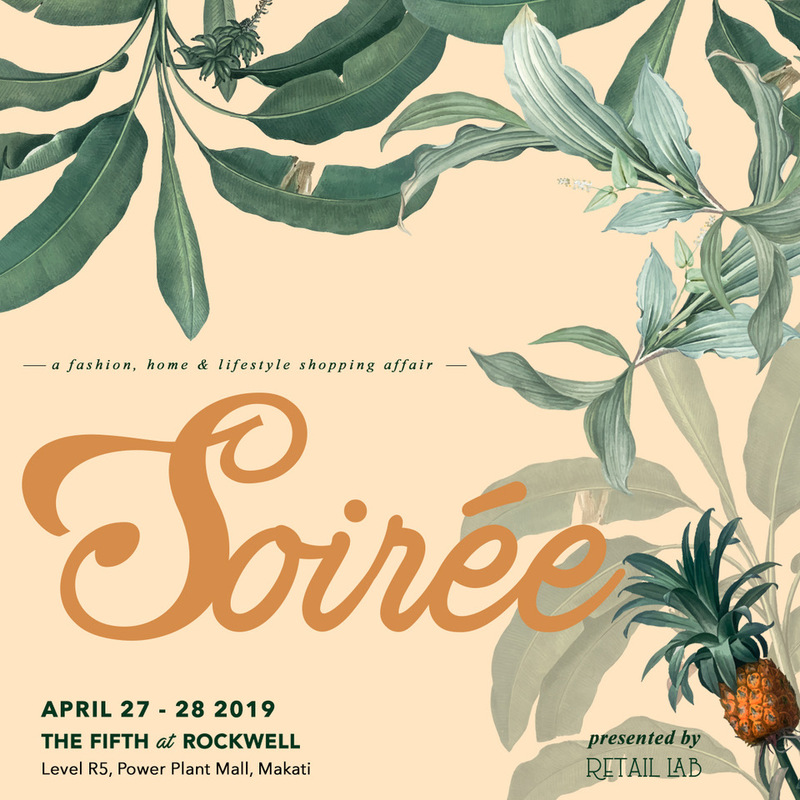 Take a break from online shopping and shop at Soirée by Retail Lab, a bi-yearly pop-up where you can find homegrown brands together in one roof. There will also be workshops here like basic plant care by Tierra Plants, sustainable living by Things That Matter, and mixing essential oils by Pure Origins. Here’s where you can celebrate the International Book Day: at an open house by the Instituto Cervantes de Manila. From 10 a.m. to 10 p.m. at Ayala Triangle Gardens, have fun at exhibits, concerts, lectures, dance contests, poetry reading, and Spanish food fair among many others. On Apr. 27, the Instituto Cervantes de Manila will celebrate the International Book Day. There will be an Open House in Ayala Triangle, from 10 a.m to 10 p.m. Expect activities like exhibits, concerts, lectures, dance, contests, poetry reading, Spanish food fair, and more. Check out their Facebook event page for updates.